I am kidding of course, the sum would be 58. 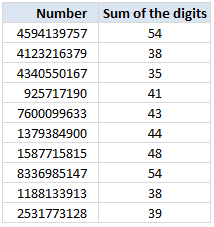 How to get the sum of digits? In order to get the sum of digits, we just need to separate and add all the numbers. Sounds simple right? But how!?! Very simple, we use Array formulas and pixie dust. to get the sum of digits. Note: you need not press CTRL+SHIFT+Enter to get this formula work. We will go inside out to understand this formula. The portion – ROW(OFFSET($A$1,,,LEN(B4))): Gives the numbers 1,2,3…n where n is the number of digits of the value in B4. The portion – MID(B4,ROW(OFFSET($A$1,,,LEN(B4))),1): Now gets the individual digits of the number and returns them as array (since the 2nd argument of MID formula is an array. The SUMPRODUCT: is the pixie dust. It just magically sums up all the digits extracted by MID(). We use a +0 at the end because MID() returns text that needs to be converted to numbers for SUMPRODUCT to work its magic. How would you have solved this? I just love SUMPRODUCT Formula. So I use it whenever I can. But you may like other techniques. So please tell me how you would solve this problem using formulas. Post your formula using comments. <code>your formula goes here</code> so that it gets displayed correctly. Bonus question: How to calculate single digit sum of the digits? Go ahead and solve it too. The single digit sum is arrived by summing the sum of digits of sum of digits of … of a number. For ex. the single digit sum for number 3584398594 is 4 (because the sum of digits is 58, whose sum of digits is 5+8 = 13, whose sum of digits is 1+3 =4 and we stop here because 4 is a single digit number). Quick similar question for anyone who sees this! I'm trying to do something similar but instead of summing digits I'm trying to calculate a sum of a text containing the text form of various formulas such as 2+4, 5*10, 6/45. I could use EVALUATE in VBA but I'm wondering if there is some trick to using SUMPRODUCT to pick apart the individual pieces and evaluate the formula. *Sorry: "...trying to calculate the value of a cell containing..."
I'm not a complete idiot, I just play one on the Internet. How do you solve the same question for decimal numbers e.g. 1,142367? Please help. I don't understand this formula. The portion ROW(OFFSET($A$1,,,LEN(B4))) results in only 1. How do you see 1, 2, 3, etc? Could you please explain this formula in more detail? I couldn't figure out any way to solve the main question that wasn't essentially the same as the previously listed methods. But Rick's bonus answer inspired to create a different, (albeit, uglier) way to solve the bonus. Brilliant work by the way everybody, I learn a lot from Chandoo and a lot from the brilliant comments, as well. Plz Check mail with subject "Numeric to work convertor" in your gmail account and do needful..
You are doing really good job, and I am still learning.....!! Note that it doesn't actually put values in A1:A7 etc, A1 is just a place holder to anchor the array to. Mid then extracts the corresponding character from the Number using the row number from the array as the Start position. Excelent. Just one question... I find it weird that you don't need to enter the formula as an array formula. Does it have anything to do with the fact that the SUMPRODUCT formula asks for arrays as parameteres? If so, why is that? @Hui Thank you very much for the explanation. Helps to clear the confusion. @George: Minor change to George's solution. Using Sum instead of Sumproduct and Pressing Shift+Cntl+Enter "SUM(MID(B2,ROW(INDIRECT("1:"&LEN(B2))),1)+0)"
Even formatting B1 as Text, there is still a limit on the size of the binary value that can be converted by this formula. The limit seems to be 36 or 37 bits depending on the arrangements of the 1's and 0's... the limit is in how big a number the formula can display before it rolls over into scientific notation (at which point the generated answer ceases to be accurate). Below is a UDF that will handle up to a 96-bit binary number (decimal value 79228162514264337593543950335) which I'm guessing is way more than you will ever need. The code is efficient (looping only as many times as necessary to process the passed in binary value), so don't worry about it being able to handle such a large binary value. The function returns a real numeric value up to 9999999999 after which it returns text representations of the calculated number. On the assumption that you do not know how to install a UDF, here are the quite simple instructions. From any worksheet, press Alt+F11 which will take you into the VB editor. Once in the VB editor, click Insert/Module on its menu bar. A code window will open up... simply paste the code above into that code window. That's it... you are done. You can now use the BinToDec function on your worksheet just like it was a built-in function. So, if your binary value is in A1, then =BinToDec(A1) will display the decimal equivalent of it. @Chandoo: The beautiful part was using the ROW()/OFFSET() to generate the sequence of numbers in a SUMPRODUCT! Thank you for adding it to my repertoire! This technique uses a technique generally at a higher level than regularly used at Chandoo.org but just the same it is useful and worth learning. When pulling apart formulas you can start on the outside, inside or do a bit of both, which is what I'll do. Your imediate response should be that there isn't an input Range or Array? we can ignore the +0 as that is just making sure that the MID(B4,ROW(OFFSET($A$1,,,LEN(B4))),1) bit evaluates to True/False if required. So what does MID(B4,ROW(OFFSET($A$1,,,LEN(B4))),1) do? OFFSET($A$1,,,LEN(B4)) says setup a Range, starting at A1, with no Row or Column Offset which is Len(B4) high, the Length of our Number in B4 which is 5. Now the real tricky bit is that Sumproduct is an Array Formula, except in some cases like this and normal Ranges you don't need to Ctrl Shift Enter as it does it automatically. So in our case it extracts from Position 1 value 1, pos 2 value 6, pos 3 value 5, pos 4 value 4 and pos 5 value 8 and Sums them to get 21. I'm working on a similar issue, but am doing something with language characters. Here's the deal, briefly outlined. The formula would need to do a simultaneous search for values, and then it would have to return the sum of those values. Is there a way in which one could adapt the formula to do that kind of move? do u have an answer for the bonus question? in cells C4 (assuming the first number is in cell B4) through C13. Can this calculation be done in excel ?